KABUL, Afghanistan President Hamid Karzai said Thursday the nation's military and police are ready and willing to take full responsibility for security in the country if the U.S.-led international coalition decides to speed up the handover to Afghan government forces. With support for the already unpopular war fading in the West, there has been growing speculation that NATO could accelerate withdrawal plans that currently call for the security transition to Afghan forces to be complete by the end of 2014, when all foreign combat troops are scheduled to leave the country. "Afghans are ready to expedite the process of transition if necessary, and willing as well," Karzai said during a joint news conference with NATO Secretary-General Anders Fogh Rasmussen. "So this is in all aspects good news for us and good news for NATO." A NATO diplomat said there was no discussion of speeding up the 2014 timeline during the meeting between Karzai and the alliance chief. The diplomat, who spoke on condition of anonymity in line with alliance's regulations, said Karzai was eager to see the next stage of transition, which would have Afghan forces take charge of security for almost the entire country. There are questions, however, about the ability of the Afghan forces to secure the country. The Afghan army has grown to 184,676 soldiers, and the country's police force now numbers 146,339 officers - putting them just short of the planned number of 352,000 members. But critics say the rapid expansion has not significantly improved their ability to plan and conduct operations without support from foreign forces in terms of logistics, air support and medical evacuations. Furthermore, the number of Afghans leaving the army has remained stubbornly high, with 27 percent of troops either deserting or not re-enlisting despite the higher salaries offered. And though the number of volunteers is still high, the army needs to train about 50,000 recruits each year just to compensate for the loss. Polls show that the 11-year war has little public support among NATO's 28 member states, most of which are cutting defense budgets as part of the austerity measures adopted to deal with the financial crises. A recent upsurge in the number of insider attacks on coalition troops by Afghan soldiers or police - or insurgents disguised in their uniforms - has further undermined public support for the war in the West. At least 52 American and other NATO troops have died so far this year in those attacks. In the past several months, there have been calls in the United States and elsewhere to accelerate the drawdown and to withdraw coalition troops by the end of next year. 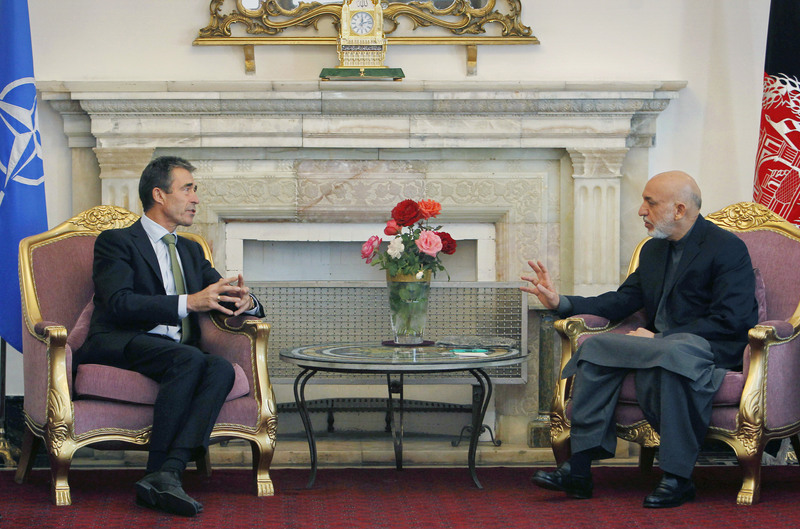 Fogh Rasmussen said the alliance remains committed to help enable Afghan forces assume full responsibility for the country's security after 2014. The military alliance has also agreed to offer a smaller, post-2014 mission to help Afghan forces with training, advice and assistance. "We are committed to continuing that cooperation with the Afghan national security forces," he said. The secretary-general and NATO's governing body, the North Atlantic Council, were visiting Kabul Thursday for meetings with Karzai, coalition military commander Gen. John Allen and commanders of Afghan government forces. The current strategy agreed to by NATO, its partners and Karzai's government is to enable the Afghans to take over the war against the Taliban and other insurgents by the end of 2014. NATO started drawing down its forces earlier this year. It currently has 104,000 troops in Afghanistan - 68,000 of them Americans - down from 140,000 the alliance had here in 2011. Among those who left are the 33,000 U.S. troops deployed to Afghanistan after 2009, when President Barack Obama ordered a surge in a bid to quell the Taliban. Karzai also said he did not believe the outcome of the upcoming presidential elections in the United States would affect Washington's long-term policy toward Afghanistan regardless of whether President Barack Obama or his Republican challenger, Mitt Romney, emerges as the winner. "America has a set strategy for Afghanistan and any government who comes in will follow that, so it will not affect Afghanistan," Karzai said.